Una breve di lista degli ultimi lavori, esperimenti e progetti in corso; su researchgate trovate invece buona parte delle pubblicazioni scientifiche. A short list of my last project works; on researchgate find my scientific publications. Così, lavorando sulla fisiologia dell’olfatto da un lato, continuando con i training e la pratica di teatrodanza dall’altro, a un certo punto semplicemente è successo. Non potevo evitarlo: le cose si sono incrociate. Ho iniziato a studiare danza moderna e contemporanea da adolescente, ho poi continuato esplorando anche altre danze e approfondendo soprattutto danze del medioriente, flamenco, teatro fisico e teatro-danza. Tutto questo si è poi unito alla mia deviazione professionale, cioé il bisogno di capire il come funziona delle cose, da un lato, e il connaturato istinto a non tenere le cose che faccio separate, anzi. Negli ultimi anni un ramo neuroscienze ha iniziato a dedicarsi allo studio di diverse discipline artistiche, per capire, per esempio, come il nostro cervello percepisce il bello e perché, cosa per esempio di un quadro o di un brano musicale ci colpisce e in che modo; studi di cui si occupa la neuroestetica. Alcune ricerche poi si sono mosse anche verso le arti performative, in particolare teatro e, ultimamente, la danza. Mentre mi addentravo in questi studi a un certo punto mi sono chiesta cosa ne fosse, in tutto ciò, dell’olfatto. Certo è un senso difficile da controllare, sfuggente, ma questo è sufficiente a ignorarlo? Nessuno si era preso la briga di mettere in scena un odore? Non dico proprio un “profumo”, ma almeno qualche puzzetta o odorino? Ho iniziato così ad approfondire la questione e a fare alcune ricerche. Inoltre, nel 2012 ho iniziato a studiare le materie prime usate in profumeria e alcuni rudimenti di composizione con profumieri italiani (Martino Cerizza e Luigi Cristiano presso Smell Atelier), e a usare gli odori in scena e durante il training. È un lavoro che continua. Aside from my scientific work in the wet lab, I have practiced for more than 15 years in performance arts. I have artistic experience mainly in dance-theater and physical theater, and other dances (contemporary, north-African and Arabic, flamenco). At a certain moment it just happened, the two main interests of my life crossed each other. During the last years some of the neuroscientific researches have started to focus more and more on how our brain perceives beauty and art, and why. Neuroaesthetics and empirical aesthetics studies try to understand the cognitive and affective mechanisms involved in aesthetic perception and their neural, physiological and behavioral correlates. Moreover, recent studies focus on performance arts and theater as well. Meanwhile I was getting into those studies, I started to ask myself: how about olfaction? So I started to work on the aesthetical dimension and practical applications of odor in theatrical space. Since 2012 I have been also studying some basics of perfume composition and raw materials with Italian perfumers (Martino Cerizza, Luigi Cristiano) and I integrate the use of odors in my training and performances. This work continues. The first part of this work is a perfume-composition that was developed during my practicing with raw materials and fragrances under the supervision of perfumer Martino Cerizza during his class at the Smell Atelier in Bologna. The perfume project-work has been presented in May 2016 in Bologna during Smell festival. This work represents a “root” of a personal project of dance-theater and smell currently in progress. D’Errico A, The nose on stage: olfactory perceptions and theatrical dimension. Book chapter in “Designing with smell: practices, techniques, and challenges“. Edited by Victoria Henshaw, Kate McLean, Dominic Medway, Chris Perkins, Gary Warnaby. Routledge Publisher, 2018. ISBN-10:: 1138955531. D’Errico A, My smelling avatar- the use of scents in new media. Book chapter in “Für den tieferen Sinn – Duft als Medium in Kunst, Design und Kommunikation“. Martin Hegel, Matthias Wagner K (Hrsg. ); Museum Angewandtekunst. Spielbein Publishers, Wiesbaden, 2016. ISBN 978-3-946718-03-1. Smellwalking at the Book Fair; in collaboration with the museum of applied arts – Museum Angewandte Kunst Frankfurt – and Spielbein Publisher, at the International Book Fair. October 2016. Breath deep, free your nose: “smell-action” for the public of the book fair, an unusual smellwalk through the fair-space and outside. Smellwalking at the Book Fair Frankfurt. Credit: perfectsenseblog. Methamorfosis in the fog. Soloperformance at Nephos Swiss Fog summer event, Martella island. Bellinzona, June 2015. Open- air studio of the dance-theater performance Duft, methamorfosis with perfumed fog installation. Concept and choreography: Anna D’Errico. Fog Intallation: Nephos Swiss Fog. Duft, methamorfosis. Dance-theater-studio performance with odor. Smell festival, Bologna, May 2015. The sense of smell creates the experimental substrate where memories take root, molding our emotions and transforming them. This is the starting point for this theater-studio centered on the olfactory component. A score with three acts corresponding to the same number of olfactory atmospheres, along a thread of free association that leads to a metaphorical metamorphosis, to the re-discovery of smell and the universe of the body. This work is developed around the research for possibilities to modulate the quality of the dancer-actor movements using training focused on olfactory stimulation and smell memory, just like the idea of evoking memories related to the olfactory sense in the spectator, or to making the perception of the scene even more vivid through the use of essences and perfumes. Concept, choreography and perfumance: Anna D’Errico. Photo credit: Anna D’Errico, Smell Festival. Odorama – scend and movement, 11 october 2018, Mediamatic, Amsterdam (Netherlands). Dance-theater scented performance. Scent installation for “Labyrinth” a collective dance-theater performance in collaboration with Antagon TheaterAktion Frankfurt during Sommerwerft Festival, Frankfurt (Germany). Food and Science Festival, 20 maggio 2018, Mantova (Italy). Odori fantastici e come trovarli- l’olfatto e i talenti del nostro naso. Experimental Scent Summit, 18 April, 2018, The Swedenborg Society, London. Fiera del riso (Rice fair), 6 October 2017, isola della scala (Verona, Italy). Gli aromi nel piatto e… nel cervello. Palmengarten Frankfurt, August 2017, Discovering the beauty of stinking with the corpse flower. 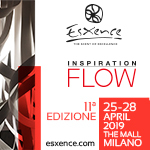 Esxence 2017, 26 March, Milano (Italy). Perception of odor and fragrances. MIC, Museo Interattivo del Cinema (Interactive Film Museum), 2nd December 2016, Milano (Italy). Il senso più profondo, ovvero l’olfatto e i talenti del nostro naso. Smellwalk at the International book-fair 2016, Frankfurt (Germany). Post, Temporary Science Centre (Perugia Post), 5th March 2016, Verona (Italy). Il senso perfetto, odoriImprobabili e puzze (im)possibili. Smell Festival 2015, Bologna (Italy). Il naso in scena, immaginari olfattivi nello spazio scenico.